Summoning beauty and transformation, Tundra explores the poetry of heaven and hell erupting in and around all of us via folklore and pom poms, in an atmosphere reminiscent of a David Lynch film. There is a nice fusion of dance, theatre and live music. It has a very authentic feel and everything just seems right (apart of smoking on stage). Very well thought through decor depicting timeless space. The piece has a momentous character. It’s here and now and it is going to have the same description 50 years from now. No doubt the atmosphere is dark and heavy, but a brilliant dancing technique of performers and a beautiful choreography makes you watch it forgetting everything else. It feels a little tribal at times, meaning that every character is probably trying to find and establish a spiritual place of comfort for themselves. They hope. It’s what keeps them sane. There are elements of realism and surrealism combined to create a flow of emotions that each of the performers are feeling and experiencing differently. It’s hell and heaven combined. Our minds, where we constantly fight battles with our inner daemons, are not always a sunny flower field. It can be dark, windy, cold and lonely. Emma Martin explored exactly that, stripping off all curtains and showing that absurdity of ourselves. Feeling uncomfortable yet? I suppose this piece just makes you realize that often we are too reserved and not exactly honest with ourselves. All and all, it’s a great performance to open 10th Dublin Dance Festival with. I might have been slightly confused about my feelings after the performance, but one thing I know – the hour just flew by it was so mesmerizing. 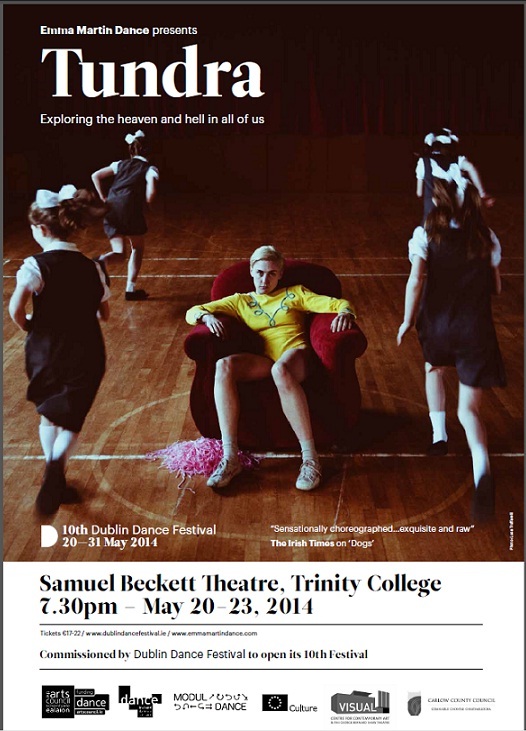 Tundra by Emma Martin Dance is on till Fri 23rd of May at Samuel Beckett Theatre. Tickets are 22/18 Euro and can be booked here.